Football is the national sport in Bolivia and along with the rest of South America, Bolivians take their football very seriously. Coaching football is also a way to unite and inspire children and by volunteering on this football placement you can combine coaching the sport with important community based social work. 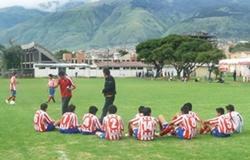 Projects Abroad volunteers work with the Football School, Pelota de Trapo. This school has been helping children through sporting activities since 1994. Volunteers work closely with the head football coach, William Ramallo who founded the school and who also played in goal for the Bolivian National team in the 1994 World Cup. This project combines coaching football with various aspects of community work and social work. The project helps disadvantaged families with nutritional problems and medical aid, and offers scholarships to the poorest children who would not otherwise be able to afford the school’s fees. There are also programmes for women and children with HIV/Aids. The football school has approximately 300 students between the ages of 7-17. As a volunteer at the football school you will be asked which ages you prefer to work with. Depending on your Spanish language ability you may be able help one of the coaches with their players. Volunteers with a good knowledge of football may be given more responsibility and the opportunity to create your own coaching programmes. All volunteers who participate in the football side of the project are also asked to participate in the community social work activities which are held for the 30 underprivileged families who live on site. This may include caring for the children, or just visiting the families and participating in daily activities. During the school year, football practice starts at about 3pm. Routines include warm up exercises and technical instructions before starting a game. The last class at the school ends at 7pm. During the school holidays the football school is also open in the mornings and afternoons.